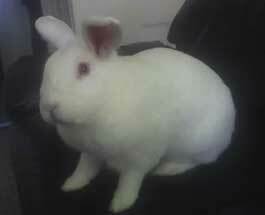 Hello there, my name is Gus, and I’m the handsome white rabbit you see pictured here. I’ve never been very concerned with superficial things like breed, but I’ve been told that I’m probably a Florida White rabbit. Of course if you ask me, the “white” part is fairly redundant in my case! Let’s get one thing straight – I’m not your average house bunny. I rule my home with an iron paw – I’ve got my human parents trained very well. (And humans aren’t easy to train, let me tell you!) Treats are dispensed when I say so, and I always get first pick of the good bits in my food bowl. I live in my house with another rabbit, named Betsy, and my human parents. Most of the time I’m pretty laid back; I enjoy stretching out on the carpet, jumping onto the couch, watching TV, and getting groomed by Betsy. I also occasionally enjoy being petted by my daddy. My favorite foods are: papaya tablets, dried cranberries, dandelion greens, kale, parsley, carrots, and Tim-Tams. I can’t really think of anything else to say about myself, so that’s all for now. Enjoy my site!